This year’s Advent daily devotionals will come to you where you are – in the form of an email! 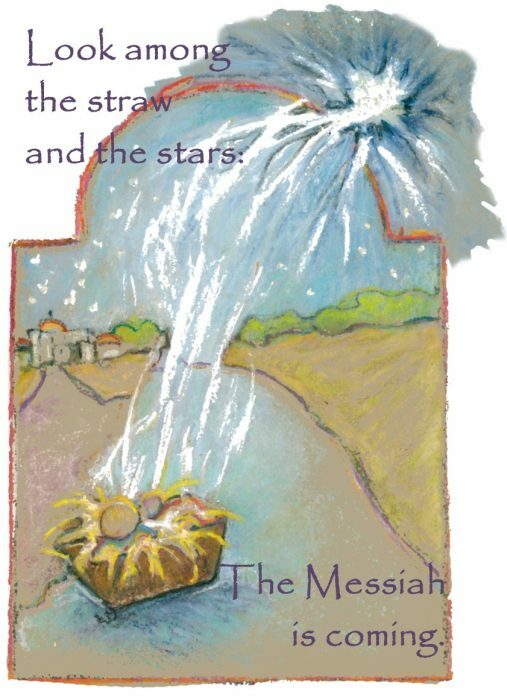 Images and words, lovingly crafted by Highland’s members and ministers, will center you in the mystery of the season of hope, peace, joy, and love. Supplemental materials to engage families with children, as well as direct your minds to justice needs using the symbols of the season will also be included. All on Highland’s newsletter email list will automatically receive these daily emails. If you are not on the newsletter list, you can subscribe on our home page. Habitat for Humanity: Volunteers from Highland will help construct a home in the Spring of 2019. For the last twenty years, Highland Baptist Church has joined with other Baptist churches in the area to build a home for people who financially qualify for the program. The Louisville Community Bail Fund (LCBF) exists to not only bail out these people, but to provide post-release support to get them from jail, fed, and into a safe and sustainable situation. While LCBF works with national networks, they are also one of the only bail funds that rely entirely on support from individuals in the social justice community. LCBF not only serves to restore freedom to an individual, but will also work to reassert their humanity and bring wholeness to their families. Please shop generously and often (!!!) at the Alternative Christmas Card display in the commons after each worship service on Sundays throughout Advent. Hope Sunday – Sunday, December 9, 8:30, 9:30, and 11:00 a.m. Please join us on Sunday, December 2, at 6:00 p.m., for a joyous service as we adorn our sanctuary and prepare our hearts for the Advent season. Music of the season will lead us in the lighting of candles, hanging of greenery, presenting the star-like poinsettia flowers, and adorning our evergreen tree with Chrismons. It is our custom to bring toys, canned or boxed food items, books, or monetary offerings to the service. The food will go in Christmas baskets that we provide to Highlands Community Ministries (HCM) for neighbors in our zip code. We also need cash donations to purchase gift cards for the perishable items in the HCM baskets. 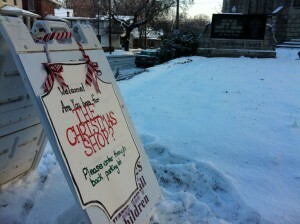 The toys and books will be sold at an 80% discount to shoppers at our annual Christmas Store. Those invited to the store are friends we met through our former Shelby Park ministry. Please contact a minister if you need an invitation. Childcare will be provided for infants, toddlers, and preschoolers. However, preschoolers are encouraged to attend with their families. If possible, RSVP for childcare by Wednesday, November 28, to Linda Campbell. A delicious reception follows the service in Fellowship Hall. Sorting Soiree – Monday, December 3, 6:00 p.m.
Highland’s Senior Adults gather early in the day working with the food and donations generously given during the Hanging of the Green service. 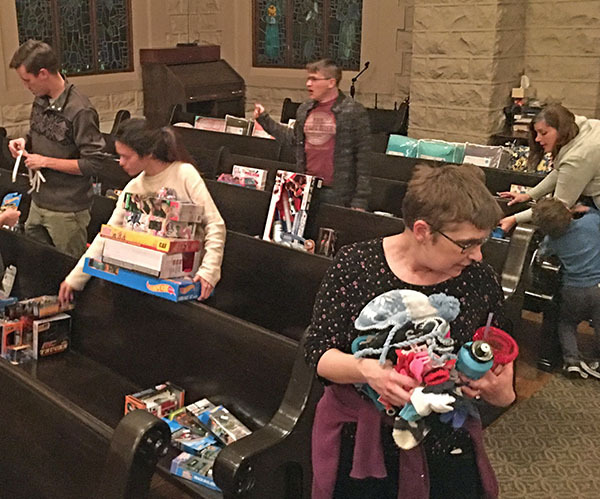 In the early evening, young adults and families with children gather to sort non-perishable foods for Christmas baskets, toys for the Christmas Store and make cards for college and graduate students nearing the end of their semester. We’ll have pizza in Fellowship Hall at 5:30 p.m. for those who need to eat prior to the event, and will begin sorting at 6:00 p.m. To make a reservation for pizza, contact Renee Purtlebaugh. 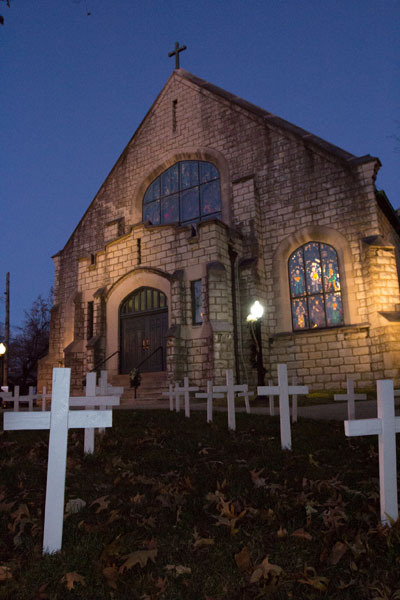 Peace Sunday – Sunday, December 9, 8:30, 9:30, and 11:00 a.m.
for God’s justice happens on Peace Sunday, the second Sunday of Advent, December 9, where we mark the pain and hope of God by placing white crosses on Highland’s front lawn in memory of Louisville residents killed in an act of violence. Crosses will create a sad memorial on our lawn during this holiday season. At the same time, the crosses signify our hope that God calls the church to work actively against violence in its many forms. The names of victims will be read in all three morning services and worshippers will be invited to carry a cross to the lawn and hammer it into the ground. Highland Baptist began this tradition in 1997 to draw attention to a rash of murders in the metropolitan Louisville area. 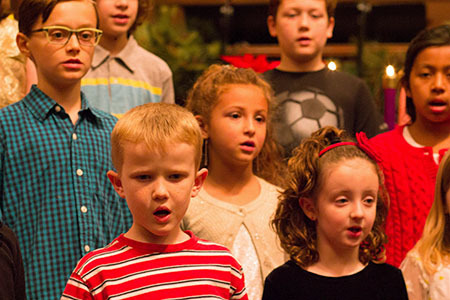 Children’s Choirs Advent Service – Sunday, December 9, 6:00 p.m. Please join us on Sunday evening, December 9, at 6:00 p.m. in the Sanctuary for a beautiful evening of music presented by Highland’s Children’s Choirs and the Children’s Handbell Choir. Childcare is provided for infants, toddlers, and twos. A milk and cookies reception will follow the service. For more information about the worship service, contact Kathy Collier. 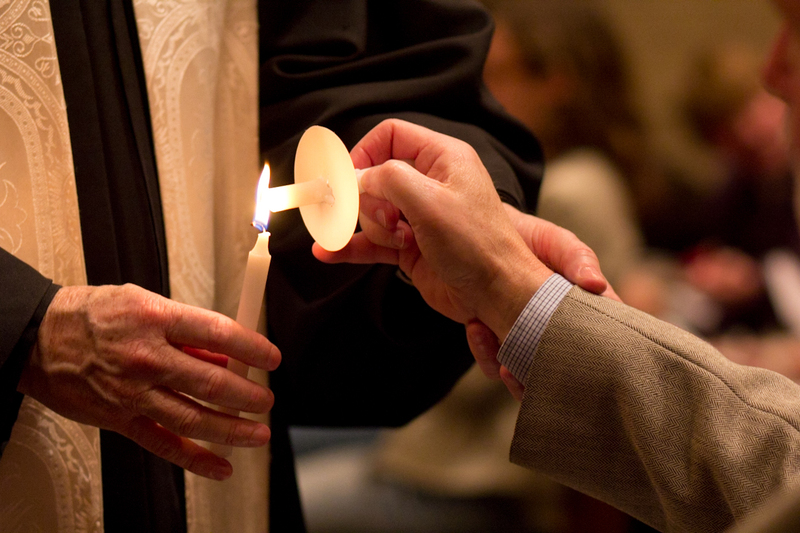 Cloud of Witnesses – Wednesday, December 12, 6:10-7:10 p.m.: Join us for a special intergenerational gathering as we listen to our “saints-in-process” share their own stories of how their faith has grown, changed, and been challenged through the years. Highlands Community Ministries Christmas Basket Delivery – Saturday, December 15, 9:00-11:00 a.m.
Every year, our congregation gives abundantly to those in need in our neighborhood through Highlands Community Ministries (HCM). All the canned good and money collected at the Hanging of the Green service will go towards food baskets for our neighbors. Bible study classes will provide gifts for people at Highlands Court through HCM. Would you or your family be willing to deliver food and gifts to our neighbors at Highlands Court? You can sign up in the Commons after each worship service on Sundays. Basket delivery will be at Highlands Court on Saturday, December 15, 9:00-11:00 a.m. For more information, contact Carol Harston at carol@hbclouisville.org or Steve Helm. Highland is excited to once again serve our community through The Christmas Store at Highland! This store has served as a wonderful way to build relationships through shopping for Christmas presents with families we have met through a variety of local ministries. Each year, you generously donate new toys and books. Parents buy these items as gifts for children from birth to age 18 at an 80% discount. Each year, the store is staffed with a small group of volunteers, so the shoppers can have a true Christmas shopping experience. Some favorites to get your shopping started are: action figures, cars, sports equipment, battery operated toys (with batteries! ), dolls of all skin hues, makeup and nail polish kits, shaving kit, craft kits, electronics, bedding, YA fiction and children’s books that represent a variety of cultural and ethnic backgrounds, and anything featuring a popular movie or television character. For ideas, click here. Donations will be collected during the Hanging of the Green Service on December 2. If you are unable to attend the service, you can place donations in the bins outside of the choir room during the week of November 26. Please be sure to mark your donations “Highland Christmas Store”. 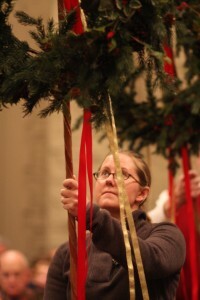 Music of the Advent and Christmas Season – Sunday, December 16, 9:30 and 11:00 a.m.
Jim England, proclaimer. Highland’s Sanctuary Choir and String Ensemble will resent a special service of Advent carols in the 9:30 and 11:00 a.m. services. The 8:30 service will not be held this Sunday. For more information, contact Kathy Collier. Holidays, Holy Days – Sunday, December 16, 7:00 p.m.
Highland’s Orchestra invites everyone to an evening of both sacred and secular music in the beauty of our stone walled sanctuary. A Christmas delight for all ages. No childcare provided. Love Sunday, December 23, 8:30, 9:30, and 11:00 a.m.
Christmas Eve Service and Service of Lessons and Carols – Monday, December 24, 4:00 and 6:00 p.m.
your way to mark the birth of Jesus, the Christ. Childcare will be provided for infants, toddlers, and twos. 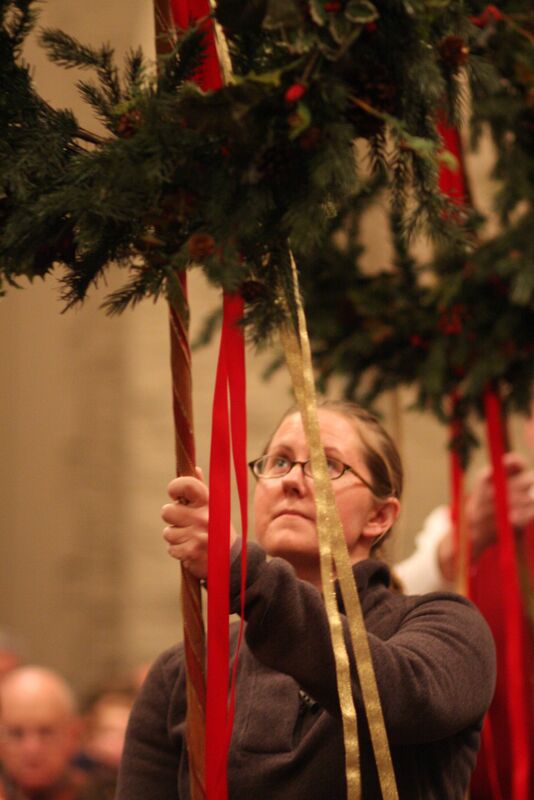 Lessons and Carols – 6:00 p.m. 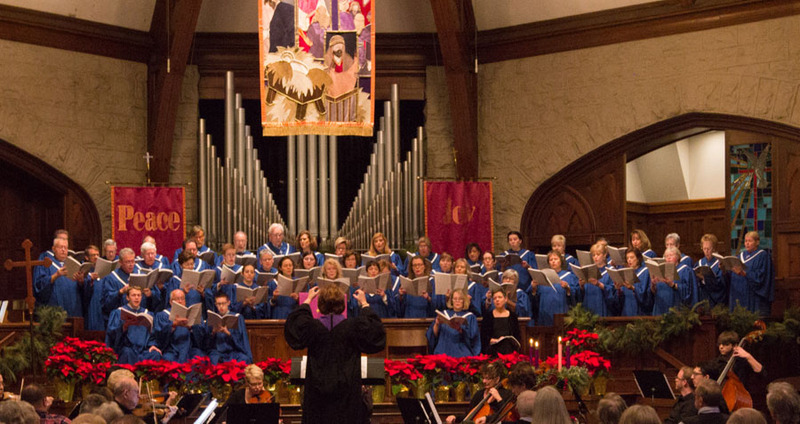 The centuries-old English tradition of Lessons and Carols tells the Christmas story through scripture, carols, and the music by the Sanctuary Choir. A candlelight ending on this holy night sends you on your way to mark the birth of Jesus, the Christ. Childcare will be provided for infants, toddlers, and preschoolers. For more information about Christmas Eve worship, contact Kathy Collier. Sunday, December 30, 10:00 a.m. Please join us for one service at 10:00 a.m. There will be no Bible study nor Worship Care so we can all be together in worship.